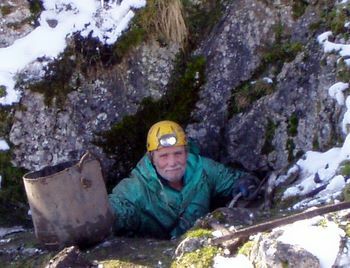 Small Mammal House is a chamber well off the beaten track in Bar Pot, originally discovered in about 1976 by Phil Johnstone and Fran Bagenal whilst LUSS were undertaking a major resurvey of Bar Pot and Flood Entrance. It may be found by entering the bedding that leads off above the Greasy Slab opposite the bottom of the entrance pitch. This leads immediately to the edge of a shallow pit which needs to be traversed around, and the low passage followed round to the right, through a shallow pool and a constriction to a rift. A short slither down enters an attractive little chamber, known as Flowstone Chamber. A climb up on the opposite side leads into a series of muddy fault chambers, and turning left leads uphill through a squeeze into Small Mammal House. Small Mammal House is an impressively-sized chamber which stretches up 20m or so, and was named after a number of piles of bones of assorted small mammals found lying on the floor, implying a link to the surface. 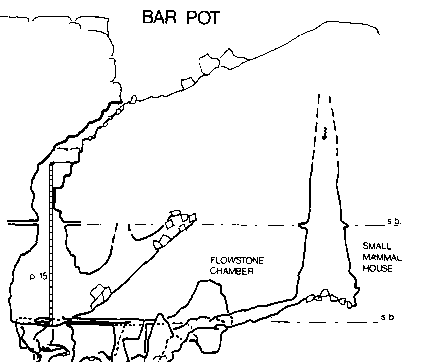 At the time of its discovery, it was radio-located to a point 2m north-east of the top of the path descending the Bar Pot shakehole, and it was estimated to reach within 6m of the surface. This document records work undertaken by Mike Wooding (MJW) and John Gardner (JWG) in late 2004 and early 2005. JWG, John Cordingley, Adrian Hall, Colin Pryor: John met John Cordingley et alia in Clapham, and was invited to accompany them on a trip to Bar where JNC wanted to look at the climb above Flowstone Chamber and also the pitch down South East Aven. Whilst JNC was climbing Flowstone Chamber, John went off to have a look at the possibilities of climbing in Small Mammal House. Although Small Mammal House is located on a fault, the walls of the aven did not appear to be over-loose, and there appeared to be positive evidence for a stream having once flowed down the south-east corner. Several sets of small mammal bones were seen. MJW and JWG: After developing a new route down South East Aven, which consists of a fine free-hang landing next to the entrance to New Hensler's Passage, a return was made via Small Mammal House. Here, Mike started climbing up the rift on the north side of the chamber, past the prominent shale band to a height of about 12m. A couple of bolts were placed for the descent. On the way out, the entrance to the chamber was enlarged a little to make access easier for tackle. MJW and JWG: Mike resumed climbing from his previous stance and after a heavy session of boulder trundling, managed to inch his way up to below a small alcove in the west wall at a height of about 18m. Here a bolt was placed and the rope secured for the descent. MJW and JWG: Mike reascended the aven to his previous stance, and worked his way upwards and to the south-east to a good ledge where a passage entered along the line of a joint at roof level. The height to the roof was about 21m. The passage proved to be about 4m long with jammed angular boulders wedged in the roof, and a choke straight ahead. Littering the floor was an assortment of surface debris - including two trouser buttons! 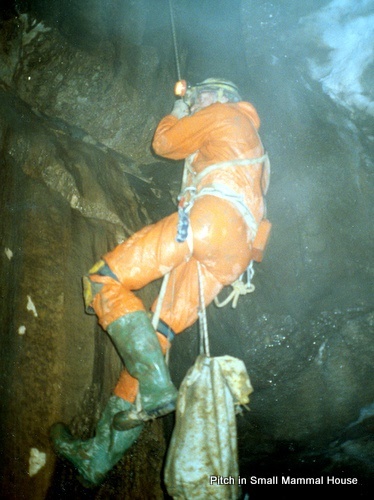 The pitch back down to the floor is superb, descending the centre of the shaft. The main belay is a Y-hang from bolts, and two bolts have been placed for a traverse line into the passage. The pitch has been left rigged. On the way back to the cars, a quick visit was made to the entrance of Stile Pot. This lies on the side of a fault some 20m from the Bar Pot shakehole, and at first sight looks a good candidate for providing the source of the passage. According to Northern Caves it is over 4m deep, but the initial impression was of being an enlarged rabbit hole. 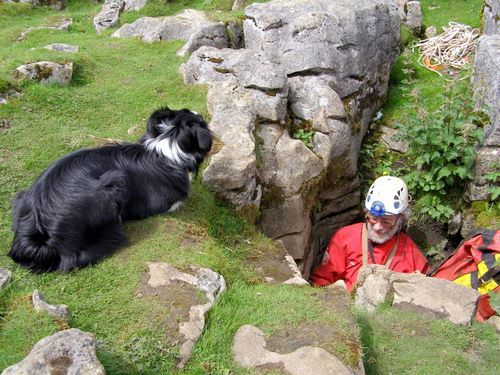 MJW: Mike paid a return visit to Stile Pot after removing some rope from Rat Hole. He managed to remove some large boulders and a couple of buckets of debris to expose a restricted passage trending down to the north-west. The spoil was discreetly deposited by the wall. 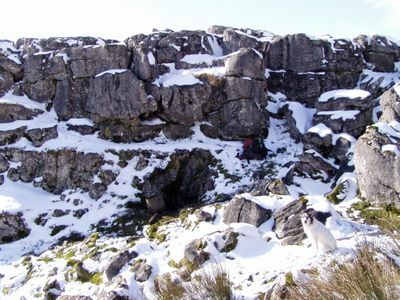 MJW and JWG: A trip to Stile Pot in very snowy conditions. At first, digging was very slow in the restricted passage, but this was helped by widening it by levering weathered slabs off the wall. Unfortunately, one of these rolled in deeper, and will probably need moving eventually. The rate of progress then increased. The current situation is that the passage trends down to the north-west for a couple of metres to a constriction, beyond which it seems to open out into a vertical feature. A prow of bedrock in the floor is currently hindering progress, and a large boulder also needs to be excavated and removed. Further widening of the walls would also be useful. Although the passage continues to look right for being the other end of the SMH passage, according to the survey it has become too deep. 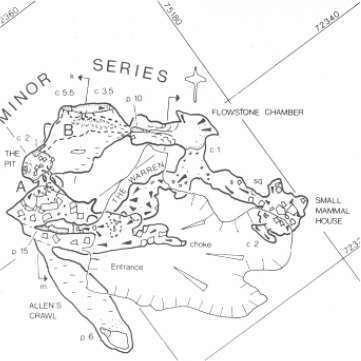 The top of SMH is marked as being five metres below the surface, and the entrance in Stile Pot is 4m below the clints, and descends a further 4m. If the two are to connect, either the bottom of the aven on the survey must be marked too high, or the surface marked too low. It was agreed that a sound test should be undertaken between the two as soon as possible. MJW, JWG and Phil Johnstone: This trip marked Phil Johnstone's first visit to SMH for almost 30 years! The purpose was to carry out sound and smoke tests between the passage at the top of Small Mammal House, and Stile Pot. Phil and JWG ascended the SMH pitch into the top passage, with Phil taking a couple of photographs en route, and a rough survey was conducted to the end. From the Y-hang on the bolts to the end choke is 7.9 metres on a bearing of 137º Grid, and the passage is about 60cm wide. In one place you can stand up and see through the wedged boulders for another metre. This point is probably within 3 metres of the surface. Just before the scheduled time hammering could be heard, so the two started to play with hammer and whistle. This went for on for about 10 minutes rather inconclusively, and so the smoke test was initiated a couple of metres from the end. The smoke went straight up the rift. On descending the pitch, the height of the floor of SMH was checked by measuring the height difference between the shale band and the floor. This proved to be 6.2m, and confirmed the position on the survey. Meanwhile, MJW had been working in Stile Pot, removing the prow, widening the rift, and digging round the big boulder. The prow was removed by drilling, and hammering wedges, and it was this hammering that could be heard from inside. He did not, however, hear the whistling or hammering initiated from within the passage. He also confirmed that Stile Pot was draughting out. After a few minutes, MJW returned to moor level and saw the last of the smoke issuing from the clints some 5 metres S-E of the path down to Bar. This point corresponds well with the survey. A couple of hours were then spent prospecting the clint area, without tangible success, and also furthering the cause in Stile Pot, which continues to look hopeful. MJW and JWG: The purpose of this trip was to take a serious look at the digging potential at the top of Small Mammal House, and so a proddling bar was borrowed from Bloat Pot and taken through to the top passage. First, a couple of jammed boulders jammed at head height in the passage were removed. This provided a proper view of the roof which is about 3m above the floor, and consists of bed rock with thin rifts leading up above the passage walls. This matches well with the topography on the surface. Attention was then diverted to the choke at the end, where a metre or so of progress was made above the big jammed boulder. The spoil was passed back and dropped down the pitch. Unfortunately, the exercise required loosening rocks in the roof, and as progress was made so a rapid retreat from falling debris became more difficult. To be safer, a longer bar is required, or the boulder needs removing. Also, a bat was spotted hanging from the roof, and it was considered better to leave it in peace pro tem. The interesting question is, how did the bat get in? It is most unlikely that it had made its way from the entrance pitch. On the whole, the site is promising. Water worn rock can be seen on the floor, and the floor seems to rise 40 cm or so at the end of the big boulder. If the boulder can be removed, digging should be very straight forward. Back down the pitch, a large boulder was removed from the entrance to the chamber to make egress easier. MJW and JWG: A return was made with a longer bar to make prodding overhead boulders safer. This proved to be effective, and a succession of large boulders were removed and dropped down the pitch. 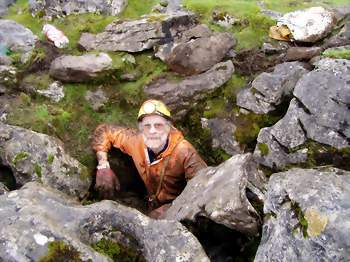 Above the large jammed boulder a small chamber was cleared containing much mud that seemed to have fallen from above. To the right, a too-small, water-worn passage followed a cross rift. Straight ahead is bedrock, and about 1½ metres up is a roof jammed with mud and boulders. Roots hung down, and aeroplanes could be heard above. We seem to have arrived at the base of a small shaft leading up to the surface. It would appear that the best way on is up, but a stronger long bar is required to dislodge the fill. It would probably be best to next identify the top of the shaft on the surface. Progress to date has been about three metres in, and two metres above the roof of the shaft. Back down the pitch, five minutes were spent clearing debris which had blocked the exit to the chamber. MJW and JWG: The main purpose of the trip was to identify the the location of the top of the shaft on the surface. John descended Bar Pot, and when he arrived at the top of Small Mammal House, he could hear Mike working on the surface. Voice contact was made, and it was confirmed that the end of the passage was directly under the widening of the gryke previously identified, some five metres south-east of the top of the path into the Bar Pot shakehole. After 20 minutes of proddling from above, and poking from below, the end of Mike's bar appeared in the roof of the dig, and a further ten minutes work on Mike's part allowed John to exit from the new entrance, which was formally named "Small Mammal Pot". A further couple of hours were spent in trying to stabilise the entrance, which unfortunately resulted in two large boulders falling into the hole. 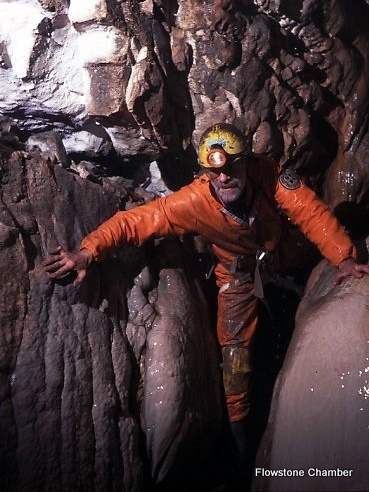 Some passing Belgian cavers helped to prevent a third from suffering a similar fate. Whilst the entrance is still negotiable, further work is required to make it safe and to tidy it up. 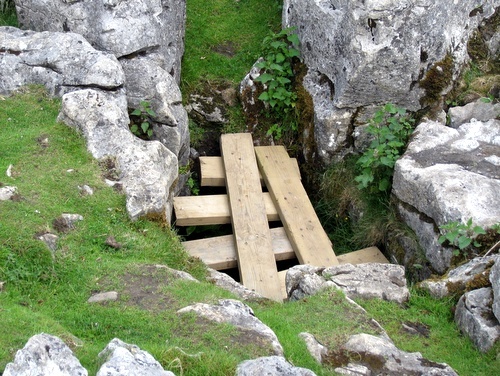 It is now thought that Stile Pot may join the system through a bedding which enters the east wall of the aven a few metres below the top of the pitch. MJW: Following a drilling trip into Bloat Pot, Mike wandered over to Small Mammal Pot to make a start on drilling P-bolt holes at the head of the pitch. He was able to confirm that although the entrance is passable, some of the fallen earth and at least one of the fallen blocks should be removed. MJW and JWG: The main purpose of the trip was to stabilise the entrance. Two large blocks were extracted from the hole with the help of Dave Elliot and Chris Boardman who were passing, a third was re-positioned to serve as a foothold on exit, and a fourth was pushed into the passage below (briefly entombing Mike in the process) to serve a similar function. A large quantity of mud was then removed to provide a flat landing below the surface drop. Mike then went to the pitch head to continue the drilling, whilst John landscaped the entrance. MJW and JWG: The entrance had become very muddy since the rain. Whilst Mike continued drilling at the pitch head, John tidied up the debris below the pitch. Unfortunately, the piles of small mammal bones, after which the chamber was originally named, have been interred under the material dropped from above. 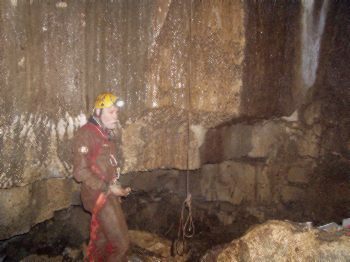 After an investigation of the 10 metre pitch below Flowstone Chamber, the two surveyed their way out to the surface from the entrance of Small Mammal House. The main pitch was de-rigged. JWG: Following a trip down Bar investigating the Whitehall area, John removed the last gritstone boulder threatening the entrance of Small Mammal Pot, and completed the landscaping. He also got a GPS reading for the entrance: NGR SD 75195 72332. MJW: Taking advantage of the fact that the BPC had rigged the pitch for the winch meet, Mike went in to the pitch head to continue the bolting. He managed to complete the Y-hang bolts, and one of the traverse line bolts, but further work is required on the remaining traverse line bolt. MJW and JWG: The remaining traverse bolt was installed. The opportunity was also taken to bolt the pitch below Flowstone Chamber. Members of the CPC: During a trip through the cave by members of the Craven Pothole Club during the winch meet, the boulder above the squeeze out of Small Mammal House fell out of the roof. This was demolished a couple of days later by members of the club, leaving the exit from the chamber as a roomy crawl. Members of the BPC: When the BPC came to rig Small Mammal Pot for the Winch Meet they found a large slab had been placed across the entrance. This was removed, and replaced with a wooden lid.